You guys! 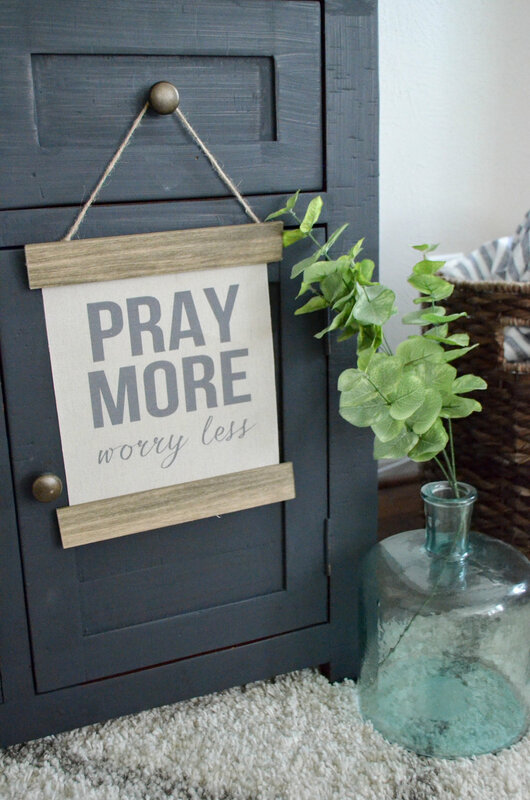 Today, I am sharing my awesome discovery for creating FOOLPROOF DIY signs using burlap or canvas. Do you want perfect DIY signs that are super easy to create? Read on, friends! I don't know about you, but I'm not the world's best stenciler. I have tried, y'all. I really have. And for those of you who can do it and achieve crisp, perfect lines, more power to you. But, that is NOT me. I wanted something easier. This is THE EASIEST way to create your own DIY signs and get perfect results every single time. I know I sound like an infomercial, but I'm serious here, y'all. This is so easy, and the results are foolproof. The key to this DIY is a product I ran across shopping at a craft store--laminated sheets. 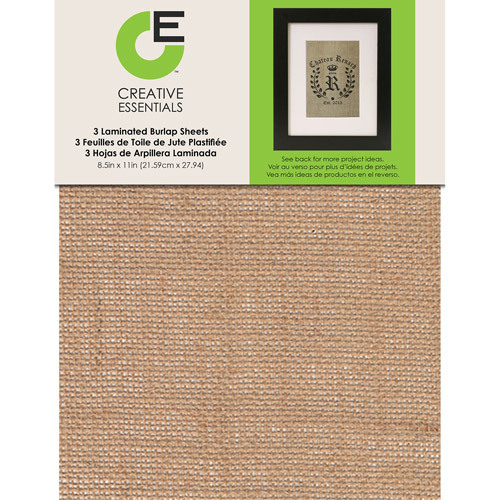 You can buy laminated canvas sheets (which I used for this project) or laminated burlap sheets. But the best part? You can feed them through your printer (just like normal paper) and get perfect results every time without the hassle of stenciling! *This post contains affiliate links for your shopping convenience. See my full disclosure policy here. 1. Cut your poplar board to size. You want to create two boards that are approximately one inch wider than the width of your sign. For my sign, I used a standard 8.5 x 11 canvas sheet, so I cut my board into 2 pieces, 9.5 inches long each. This gave me a 1/2 inch of overhang on each side. I used a miter saw to cut my board, but a circular saw would work too. A hand saw will also work if you don't have a power saw. 2. Sand one side and both ends of each poplar board, using a 120-220 grit sanding block or sponge. 3. Stain one side of your poplar boards according to package instructions. (You can stain both sides if you want to be an overachiever, but since no one sees the back, I didn't bother). Don't forget to stain the ends of your boards! I used Minwax stain in Driftwood for this project. 4. Allow your stained boards to dry completley. 5. While your boards are drying, find a printable of your choice and print it on a laminated canvas sheet. You just load it in like regular paper, press print, and it comes out perfect! I used this printable by Over the Big Moon, which I fell in love with at first sight! I love this message, and I think it's a perfect daily reminder we all could use. 6. Once your boards are dry, using a staple gun, staple the canvas sheet to the boards from the back. Turn the stained part of the boards face down, place the sign (face-down) between the two boards, and staple away. There was more "white space" at the bottom of this printable, and I wanted a more "centered" look. So I eyeballed how I wanted to position the sign between the top and bottom board, and stapled it in place to both boards. Then, I used an exacto knife to cut off the excess part of the sign. 7, Cut a piece of jute string to size. Tie a knot on each end. Staple the jute to the back of the top board, over each knot. 8. Bam. Your sign is ready to hang and enjoy!! 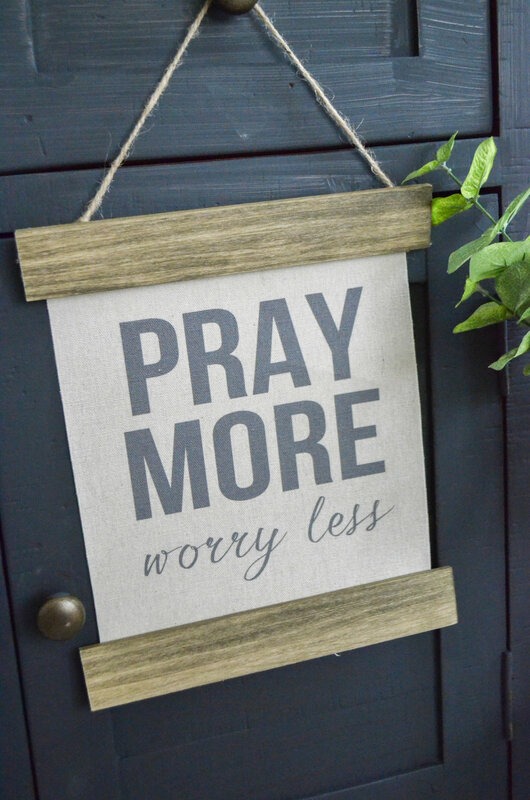 I hang this one all over the house, like in the kitchen, below, the backpack station, doorknobs, and even on our entertainment center in the living room. If you make a printed sign like this, I'd love to see it! Creating Modern Farmhouse Style The Simple Way.